Before I became a farmer I worked at an organic CSA. Before I worked at an organic CSA, I ate McDonalds. I ate MTO from Rutters and I ate sandwiches wrapped in plastic. In my defense I was in college, and I didn’t know any better. After I graduated (malnourished by the way) I started working at Goldfinch Farm. I put my hands in the dirt, I learned how to plant seeds and how to tend the magical plants and give us food. I learned about nutrient cycles and soil microbes, beneficial insects and the way the sun smells. I learned about GMOs and roundup. For the past five years I have never given a thought to where my food comes from. Everyone I know is a farmer or a home gardener. We all understand the value of growing our own food and exalt in the opportunity to work with our Mother Earth to feed ourselves, our families and our communities. This summer I am not farming. I have taken a break from the life I love and understand to move to Ohio and help my sweet momma in her fight against breast cancer. So here I am in a city I don’t know, surrounded by landscaped lawns and golf courses and I wonder, what the hell am I going to eat this summer. I am trying to navigate local harvest and the internet as a whole and I feel totally overwhelmed. How do you know if a farm is organic? How do you know if the farmer talks to their plants while they are weeding? How do you know if they love the honeybees? Do they enjoy their work? Do they feed their families Dandelion salads and Nettle tea? I will tell you how you know. You ask them. You go to the farmers market and you ask them. Ask them what the birds say to them at dawn. Or what their field smells like at dusk. Ask them how they grow your food. Ask them why they became farmers. Ask them to see the dirt under their fingernails. Ask them about their favorite vegetable and the best way to prepare it. Farmers love to talk about food, and if they don’t, then find another farmer. You want vegetables with heart, vegetables that were loved. There is nothing more empowering than being handed a tomato by the person who has lovingly tended it from seed to seedling to fruit. 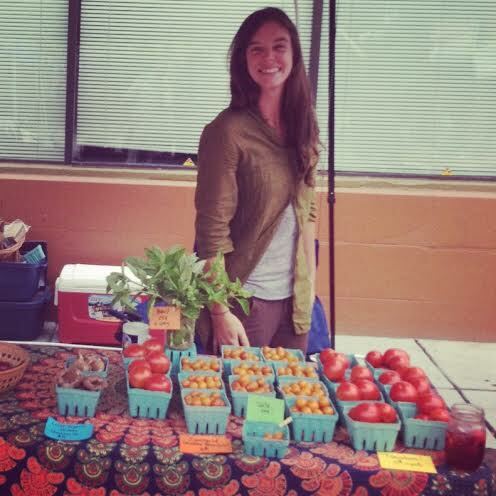 The incredible Farmers of East Side Market are passionate about growing food for you and your family. Growing food with the most care and respect for our planet and the most care and respect for your health. So do yourself a favor and head to East Side Market and talk to these beautiful women about their vegetables. Why eat wild foods? Reasons abound!